Message: Don’t dismiss tighter environmental and health-based laws as an unnecessary burden. Instead of acknowledging the seriousness of its failings, the government keeps reiterating that 99% of the UK’s land mass (i.e. area) complies with air quality laws. For a policy to be sustainable, it must respect the five principles of: ‘Living Within Environmental Limits; Ensuring a Strong, Healthy and Just Society; Achieving a Sustainable Economy; Promoting Good Governance; and Using Science Responsibly’. Source: page 8 of ‘One future- different paths. The UK’s shared framework for sustainable development’ (HM Government 2005). A government ‘green new deal’ should be used to fund the changes needed to comply fully with air quality laws in London. The Mayor of London should commit to deliver such a package of measures in a timely manner. The UK has a choice for London 2012: ‘Ridicule for breaching air quality laws every year since 2005’; or ‘A standing ovation for showing the world how to address air pollution and sustainability issues’. Source: Campaign for Clean Air in London’s (CCAL’s) ‘The London Matrix’. There needs to be a common recognition of the quantum and rapid pace of change required to deliver compliance with key public health standards. To achieve at least World Health Organisation recommended standards of air quality sustainably throughout London. 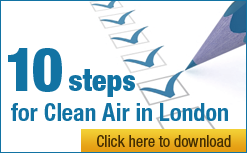 At a minimum, to achieve compliance with health-based air quality laws throughout London. Note: air quality laws are assessed mainly in whole calendar years and the key obligations are in respect of NO2, PM2.5 and PM10 (with requirements also for ozone (O3)). Success will depend on clear commitments, unambiguous plans, integrated policies and urgent action. 1. LAEC emphasises that air quality is a health issue first and an issue of legal compliance second i.e. it may be acceptable from a (narrow technical legal) compliance perspective for the UK government to apply for a time extension to comply with limit values for PM10 and NO2 but it is not acceptable from a health perspective. 2. There should be a commitment to ensure that concentrations everywhere continue to decrease as there are considerable uncertainties around the levels beyond which no further health benefits are gained (and on the identification of all susceptible populations) i.e. air quality must be improved even where it already meets European Union (EU) limit values and/or Air Quality Strategy Objectives. Note: the legal limit for PM2.5 in 2020 is still twice the WHO recommended limit. 3. The LAEC calls on the government to commit to comply fully with air quality laws. 4. The LAEC calls on the Mayor of London [and local authorities] to commit to use his [their] ‘best efforts’ to implement successfully actions to improve air quality in London, when it exceeds limit values (NO2, PM10 and PM2.5), which are meaningful when judged in the context of all his [their] available powers and the deadlines applicable under United Kingdom and European law. 5. The LAEC calls on the government and the Mayor to show quantitatively how, by adopting the recommendations highlighted by the LAEC in this report and otherwise as necessary, they will together deliver compliance with health-based air quality laws including all deadlines in London. 6. Governance and policies should be integrated at a national, regional and local level across energy, planning, transport, waste, climate change and air quality to achieve cost savings and other benefits. To avoid delay, this integration may need to be achieved over a period of time. 7. All obligations to reduce air pollution must be met. Any trade-offs between climate change and air quality should be made in an explicit and transparent way e.g. through the application of CCAL’s ‘The London Principle’. This states that ‘A disbenefit of 1% in climate change terms (e.g. in carbon dioxide emissions) should be accepted when there is an associated benefit of at least 10% in air quality terms (e.g. in emissions of particulate matter or oxides of nitrogen) (and vice versa)’ e.g. diesel should be used in the countryside but not in cities. Note: the problem with diesel is its harmful emissions i.e. particulate matter, oxides of nitrogen and other hazardous gases (of which NO2 is an indicator). Heavy duty diesel vehicles operating in cities must be fitted with appropriate after-treatment; studies have shown this approach to be ‘CO2-neutral’ (and very positive for air quality). Petrol and diesel engines will only begin to be climate change and air quality ‘neutral’ from about 2015 i.e. when Euro 6/VI emissions standards apply for new vehicles. 8. The Mayor’s Air Quality Strategy must be driven by health benefits and compliance with health based air quality laws including deadlines. Cost benefit analysis must include full health and premature death costs/benefits. It must also address the negative impact on London’s ‘brand’ of having the highest average annual levels of NO2, a toxic gas, of any capital city in western or eastern Europe. 9. The Mayor’s Air Quality Strategy must consider and include best practices across Europe and elsewhere. It must avoid the ‘busy fool’ scenario by focusing effort on the most meaningful measures in each ‘area’. Success will depend on Londoners’ understanding why action is needed and the part they need to play. 10. A combination of massive awareness building, education and personally motivated behavioural change offers the most powerful and cost effective method of reducing the health impact of air pollution. ‘Modest’ price signals will have an important part to play in motivating behavioural change. 11. The LAEC should emphasise the importance of measures for the most vulnerable especially children and seniors. 12. The importance of indoor air quality should be emphasised noting specifically that it can be worse than ambient air quality. The World Health Organisation has reported that housing and the indoor environment affect health and well being resulting in acute effects ranging from sneezing and coughing to outcomes such as cancer, chronic respiratory disorders and fatal injuries. Good ventilation, the use of clean fuels and the elimination of damp are important mitigants. 13. As best practice, all vehicle sale advertisements in London should include [where technically available] details of emissions of NOx and particulate matter (PM) to the same extent as with carbon dioxide (CO2). Press the government to back this measure with legislation so people can see why, in terms of air quality in cities, diesel vehicles will not begin to match petrol standards until around 2015. Do not be dissuaded by threats of over-complication – the US Environmental Protection Agency has a simple air quality/climate change scoring system for vehicle purchases. 14. Kings College London should be invited to consider revising the public bulletins for London to improve their linkage to EU limit values. Current air quality descriptors (Low, Moderate, High and Very High) pre-date the EU limit values and as a consequence it is possible for air pollution to be ‘Low’ all year and the limit values to be breached by a wide margin – this is a confusing message for the public. Suggest the London Air Quality Network should include a line showing air quality legal standards on graphs of air quality and convert parts per billion to micrograms per cubic metre. 15. LAEC should lobby the government to include PM2.5 in the UK’s public information system. General public awareness of this pollutant should be encouraged by increasing the profile of PM2.5 measurements in the LondonAir web site and the incorporation of PM2.5 in the UK air quality information system. Reductions in PM2.5 will drive health benefits to 2015 and 2020. 16. The government and/or the Mayor of London should issue regular smog alerts e.g. why have there been several airTEXT warnings for high pollution in central London in late March 2009 but no government or Mayoral announcements? 17. Increase public understanding of ‘green heat’ i.e. low carbon (mostly biomass) heating can have other (negative) environmental impacts and biomass should be avoided generally in densely populated urban areas. This needs to be backed up by appropriate legislation and strict enforcement action. 18. Local authorities and others should be encouraged to use their existing legal powers to ‘blitz’ engine idling in long traffic queues since such action could achieve multiple objectives e.g. save cost, reduce pollution and raise awareness. Success will depend on reducing traffic and making cleaner and greener what remains. 19. The aim should be to: reduce the need for travel movements through better planning; encourage the use of public transport; promote more efficient vehicle movements (e.g. car clubs and freight); and make clean and greener what remains (e.g. electric vehicles supplied from renewable sources). 20. Policy makers should use CCAL’s ‘London Circles’, of overlapping measures to reduce Congestion and Emissions, to assess and communicate the merits of measures to reduce emissions and congestion. These circles overlap since, for example, road pricing can lead to reduced emissions and low emission zones can lead to reduced congestion. viii. The area of the LEZ(s) must be set to achieve the necessary reductions in air pollution concentrations. It might include initially the central and western extension of the congestion charging zone from 1 January 2010 (for c£10 million) followed by all necessary zones by 1 July 2010 e.g. everywhere within Transport for London’s ‘inner cordon’ of manual count sites; Heathrow etc. Incentivise, through recognition and otherwise, companies to adopt standards ahead of those for the most stringent inner LEZs (e.g. tighter and/or faster). 23. Planning (e.g. transport strategies) should include targets for: reducing dieselisation of the vehicle fleet in London and/or its harmful effects; modal shift to less polluting modes of transport; smoothing traffic flows; and behavioural change (e.g. through travel planning (personal and business) and smarter driving). These measures should be backed by a commitment to assess their impact on air quality. 24. Black taxis and private hire vehicles ‘picking up’ in the most polluted areas (aligned with inner LEZ(s)) should be required to meet at least Euro 4 engine emission standards for particulate matter and NOx by 1 September 2010. To be funded by passenger fares and/or fully by the government ‘green new deal’. 25. Taxi Emissions Strategy to be updated from 1 July 2008. Encourage Transport for London to provide funding for all cost effective measures proposed by the Public Carriage Office (judged relative to the cost of other air pollution reduction measures available to the Mayor of London/TfL). Consider alternative fuels for taxis (and others) e.g. biomethane created from organic waste (which would benefit both climate change and air quality strategies). 26. Funding to be made available to develop electric taxis meeting Public Carriage Office standards. 27. Encourage Transport for London to provide funding for all cost effective measures in relation to London’s buses (judged relative to the cost of other air pollution reduction measures available to the Mayor of London/TfL) that would improve sharply air quality in London and meet deadlines. 28. London Transport’s captive bus fleet to be required to meet at least Euro 4/IV engine emission standards to include a massive, urgent retrofit programme for the abatement of NOx using Selective Catalytic Reduction (SCR) technology or better e.g. ‘SCRT’. Government ‘green new deal’ funding. CCAL understands that all the diesel vehicles which do not meet the Euro IV standard have already been fitted with particulate traps as a consequence of the TfL retrofit programme. What is needed now is to retrofit NOx abatement technology such as SCR. In doing so, operators would not remove the particulate trap but would end up with (for example) SCRT (or equivalent). SCRT and similar systems require space under the vehicle which may mean that only 80% of the fleet would be suitable for this retrofit technology. CCAL understands that this technology was developed and tested over three years on London’s buses and it works well. This technology has been deployed widely across Europe e.g. Belgium, Sweden etc. 30. All particulate traps used on diesel vehicles must be ‘fit for purpose’ i.e. not result in an increase of direct/primary NO2. Technology and testing standards and enforcement must be reviewed. 31. The government’s Reduced Pollution Certificate, which introduced a register of approved retrofit particulate traps for London, should be re-opened as the basis for a national accreditation scheme and extended to include technology and testing standards for the abatement of oxides of nitrogen. For NOx abatement (e.g. SCR) systems fitted during vehicle manufacture (to meet Euro IV or V emissions limits) the onboard diagnostics ensure that the vehicle does not run without urea if that is required for the engine to meet the emissions limits to which it was manufactured. For retrofit, there should be a standard chassis-dynamometer test to approve generic technology (typically a Millbrook test on the FIGE transient cycle) and to specify that the retrofit system must contain a datalogger which can be interrogated by one of the vehicle testing stations (e.g. VOSA) when the vehicle is presented for its annual test. Such a scheme may offer owners of the most polluting vehicles the opportunity to upgrade their vehicle rather than replace it. TfL should be consulted on the form such a scheme should take. 32. An ‘alternative fuel strategy’ should be developed for London setting out aims and objectives for the next five, 10, 15 and 20 years. It must be backed by funding and action. 33. Congestion measures: introduce dynamic road pricing (e.g. ‘tag and beacon’ or its equivalent) along the most congested roads and align, if appropriate, with the Olympic Route Network i.e. roads designated ‘Core’; ‘Venues’; and ‘Alternative’. It may be possible to link road pricing to vehicle emissions. 35. Propose low emission zone to address shipping and port emissions. Include the Thames, the whole Thames Estuary and lobby for European coastal zone as the United States and Canada are proposing. Success will depend on energy savings and efficiency, better insulation, integration of policies and addressing the most polluting building practices. 36. Low carbon energy (e.g. renewable/nuclear) must be brought on line as soon as possible to improve air quality (and meet climate change obligations) e.g. electricity from the east Thames power stations is not good for London’s air quality and is certainly bad for climate change. 37. Measures to reduce climate change and air quality emissions from new developments should be incorporated into the revised London Plan and rolled out across London. 38. Measures to actively encourage and support building insulation should be accelerated. 39. Measures are needed to speed up the replacement of domestic, commercial and industrial gas boilers to reduce emissions of NOx and CO2. Note: there is a major policy synergy between climate change and air quality. Gas boilers up to 70 kilowatts come under British Standard EN 483:2000 which includes five classes for oxides of nitrogen (NOx). Condensing boilers became mandatory in 2004 but there are millions of older, dirtier, less efficient boilers around. London needs a government funded ‘green new deal’ with ‘scrappage’ schemes. 40. Planning conditions need to encourage in cities the use of clean communal heating (e.g. combined heat and power) or simple electric heating rather than gas central heating. Biomass should only be used when properties are ‘off the gas grid’ (see below). 41. ‘London Best Practice Guidance: The control of dust and emissions from construction and demolition’ must be included in all section 106 agreements (or similar) in the most polluted parts of London. Success will depend on London avoiding the problems created historically by biomass burning e.g. the use of coal and wood fires. 42. Biomass development needs to be geographically managed and de-coupled from new building development. This should involve either a moratorium on biomass in areas with poor air quality or allowing only biomass boilers that meet the very cleanest emission standards. This would require developers being given more flexible ways of complying with local renewable energy planning conditions (‘Merton Rules’) e.g. pooling resources to concentrate on biomass deployment in areas without gas grid connections. 43. There should be a ‘renewable hierarchy’ which gives greater emphasis to non-combustion renewables in London. Solid biomass (e.g. wood chips) should be actively discouraged or prohibited in London. Non-combustion renewables should be used to meet on-site renewable energy targets. Note: burning biomass, even with special equipment such as wood pellet combustors, produces orders of magnitude more particulate matter than well-tuned oil or gas devices producing the equivalent heat. In addition to particulate matter, wood smoke emissions contain certain components such as carbon monoxide; various irritant gases such as NO2, sulphur dioxide, hydrochloric acid and formaldehyde; and chemicals known and/or suspected of being carcinogens such as polycyclic aromatic hydrocarbons and dioxin. Some liaison will be needed between Defra, DCLG and DECC e.g. on the Code for Sustainable Homes (starting in 2016). 44. Lobby the government to provide better powers for local authorities to control biomass uptake. At present, the Clean Air Act is not designed to control biomass uptake in the modern air pollution ‘climate’. 45. Local authorities should be offered education and up to date guidance on their enforcement role in respect of ‘Clean Air Act’ issues. In particular, their enforcement role will be important given the rise in popularity of small wood burning appliances. 46. Festival bonfires should be discouraged since they are an increasing problem. People should be warned about the harmful effects of air pollution caused by large fires and fireworks. 47. The Mayor of London should propose a list of top 10 most effective measures to be considered by each local authority with a number to be ‘required’ e.g. efforts within the borough to promote understanding of air quality issues; and joining-up the city-wide cycling and electric charging point schemes. 48. The Mayor London should deliver economies of scale and cost efficiencies for boroughs by providing centrally standardized cost-benefit assessments and other ‘packages’ of measures to avoid the need for each borough to repeat the same air quality improvement ‘exercise(s)’. 49. The Mayor of London should ‘direct’ boroughs to include air quality criteria in emissions related parking charges i.e. to emphasise the dangers of diesel emissions in cities. 50. The Mayor should ‘name and shame’ all boroughs in London that have not declared an Air Quality Management Area that should have done so and/or an Action Plan to improve air quality. Success will ensure that air quality is ‘visible’ and underlying sources and trends are well understood. 51. Lobby the Mayor of London to ensure that the London Air Quality Network has sufficient monitoring sites to determine compliance with the limit values and exposure concentration obligations for PM2.5. The monitoring infrastructure should be sufficient not only to demonstrate compliance but also to inform actions for the management of this pollutant. This recommendation is very important since: exposure reduction for PM2.5 will drive air quality health benefits once limit values are met; and the baseline is being determined between January 2009 and December 2011. A ‘flaky’ baseline would undermine the next decade of health benefits. 52. Particulate matter measurements should be utilised for more than just regulatory compliance. For example, they should underpin air quality management strategies through source attribution and be part of an ongoing programme of activity to help the understanding of health effects e.g. through local/central government partnerships. There must be such a partnership/strategic plan for London. 53. Research is needed to establish what can be done to tackle the non-exhaust particulate component of PM10. If funded, the City of London might be invited to take a lead on managing this programme. 54. LAEC to urge the European Commission (the Commission) to oppose the granting to the UK of a time extension to comply with limit values for dangerous airborne particles (PM10) unless the UK submits a convincing plan to achieve such standards throughout London by 11 June 2011. 55. LAEC to urge the Commission to progress the recently launched infringement action against the UK on PM10 until either the UK: has approved a time extension notification; or complies in full with the limit values for PM10. 56. LAEC to urge the Commission to require any Member States due to breach the annual exceedance limit value for NO2 (i.e. not more than 18 hours over 200 micrograms per cubic metre) by 28 February 2010 to submit any notification of a time extension request for NO2 by 31 March 2010. Note: this would be like the four months given to the UK to submit a Time Extension Notification on PM10 (i.e. 31 October 2008). The level was breached on 9 January in 2009. 57. Government urged to prepare urgently a contingency plan to ensure consequential requirement of limit value plus margin of tolerance for NO2 at least will be met from January 2010 if a time extension is obtained for NO2 from 1 January 2010 to 1 January 2015. 58. LAEC to urge the government to ensure selective catalytic reduction equipment is fitted to all coal fired power stations in the UK by 1 January 2010 to reduce acidification and NOx over London. Link to compliance with National Emissions Ceiling Directive. 59. Lobby the Greater London Authority Group (GLAG) to implement fully now, for all its contracts, the London Best practice Guidance on ‘The control of dust and emissions from construction and demolition’ including the use of ultra-low sulphur fuels and the fitting of suitable after-treatment devices on equipment with power outputs over 37 kilowatts. The GLAG must take a lead in this area having published this policy in December 2006. 61. Lobby government for coherent taxation and incentives to motivate people to make sensible air pollution decisions i.e. not myopic CO2-only decisions which favour diesel. 62. Ensure London 2012 complies fully with the Host City Contract obligations as they relate to air quality. 63. The Olympic Delivery Authority (ODA) must implement fully now its commitment to comply with the London Best practice Guidance on ‘The control of dust and emissions from construction and demolition’ including the use of ultra-low sulphur fuels and the fitting of suitable after- treatment devices on equipment with power outputs over 37 kilowatts. The ODA needs to take a lead in this area. 64. London 2012 should be monitoring and reporting on air quality around the Olympic venues for PM10, NO2 and ozone including according to WHO recommended standards to allow transparent international comparisons. This work should include an assessment of breaches of limit values near all the Olympic sites and the specific contribution of London 2012 activities to these exceedances. The ODA should invite (and pay) Kings College London to do this work as an independent body. 66. The Olympic Route Network (ORN) must be analysed carefully to assess whether air quality standards will be breached anywhere along its length during London 2012 and the impact of displaced traffic. Appropriate action must be planned well in advance and the opportunity should be taken to ‘join-up’ thinking on: the ORN; one or more additional inner low emission zones; dynamic road pricing (such as tag and beacon or its equivalent); and ensuring a legacy for London.